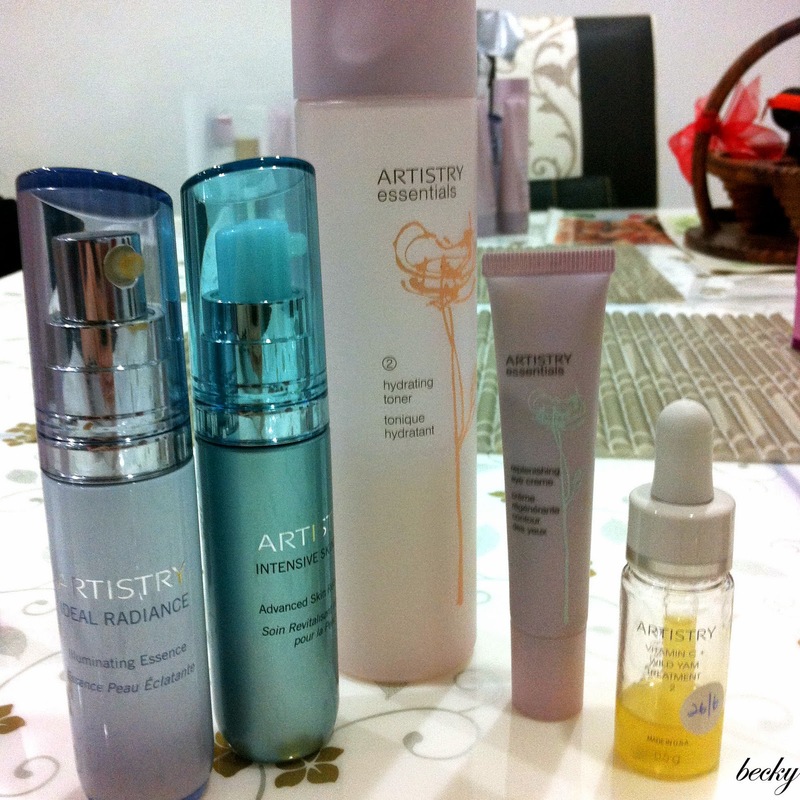 2 weeks ago, Sin Yee and I had our very first beauty scraping therapy by Arte Belle. Both of us were kind of anxious as we did not know what to expect. Our beauticians were 2 very young and really pretty ladies - Yee Mun and Fiona. So, what is "beauty scraping therapy"? It is what commonly know as "Gua Sha" a.k.a "美容刮痧". I think our impression of Gua Sha is painful and the skin will turned very red after scraping. Scary huh?! However, this beauty scraping therapy is in fact very relaxing and painless. 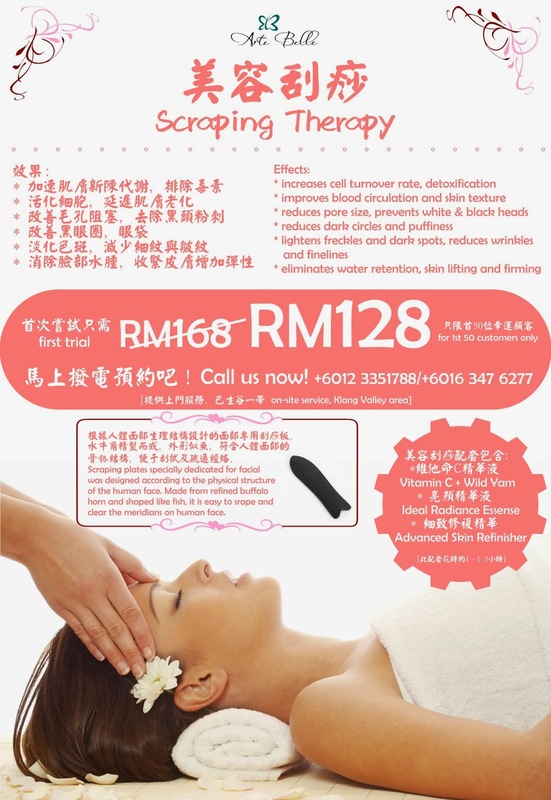 "Gua Sha is a traditional treatment that has been used for thousand of years. 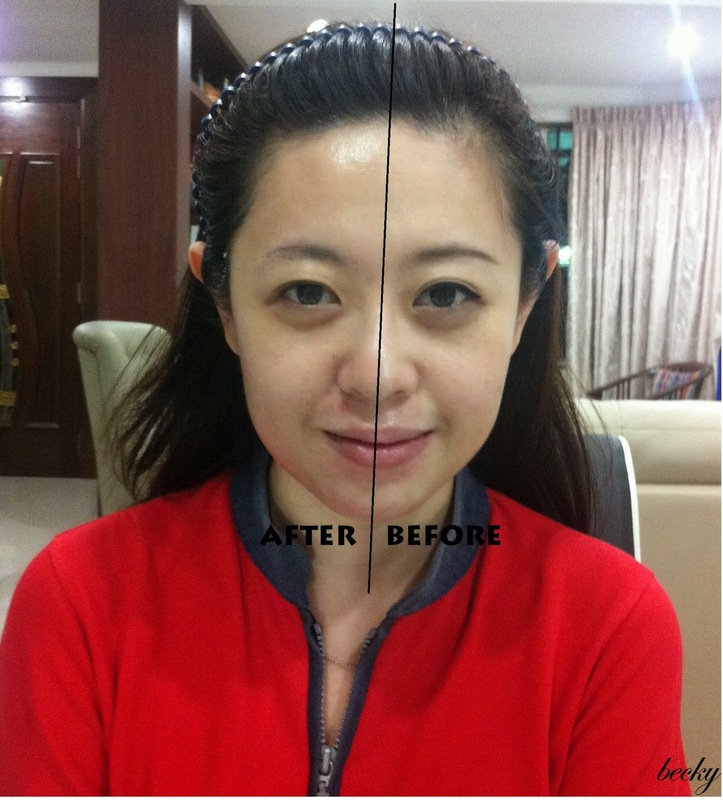 By using buffalo board to scrape our face, it can enhances facial complexion and skin radiance. Gua Sha can also energizes our internal organs and strengthen immunity." 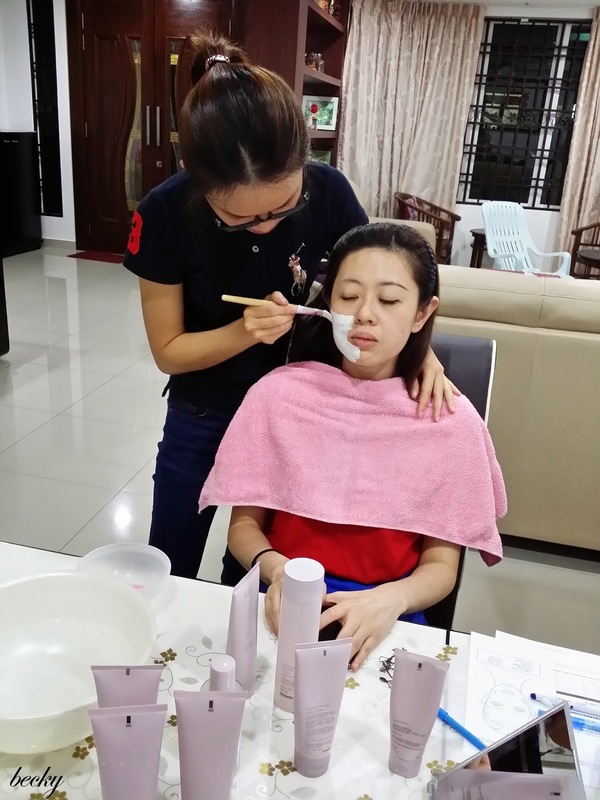 Traditionally, therapist will use oil or baby to perform Gua Sha; but we know that our face is more delicate and is not suitable to be massaged with these kind of oil. Arte Belle understands this too. 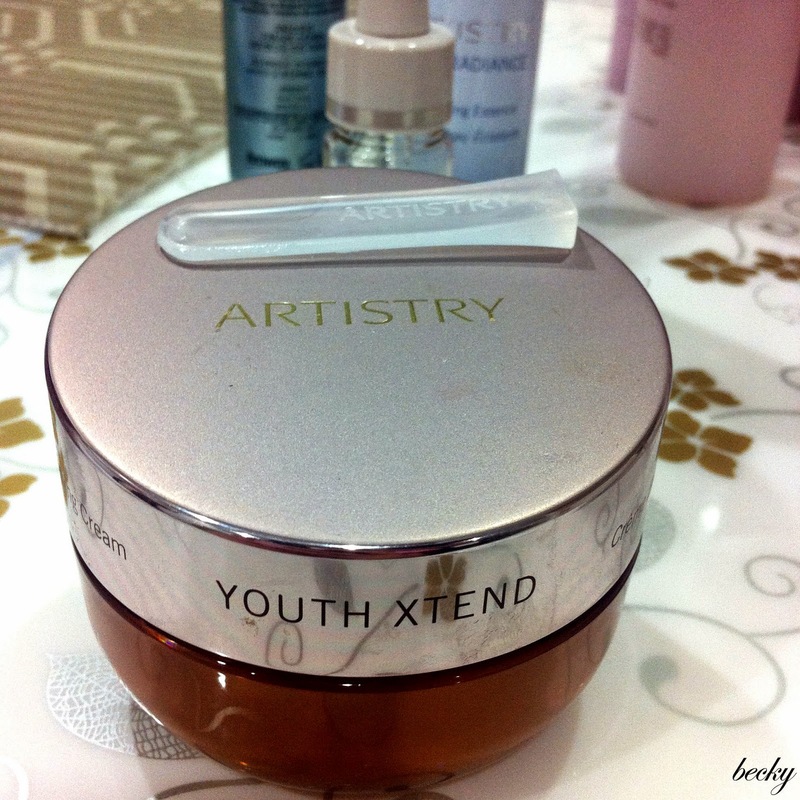 Instead of using normal oil or baby oil, they use Artistry - a world-renowned product - on their clients. 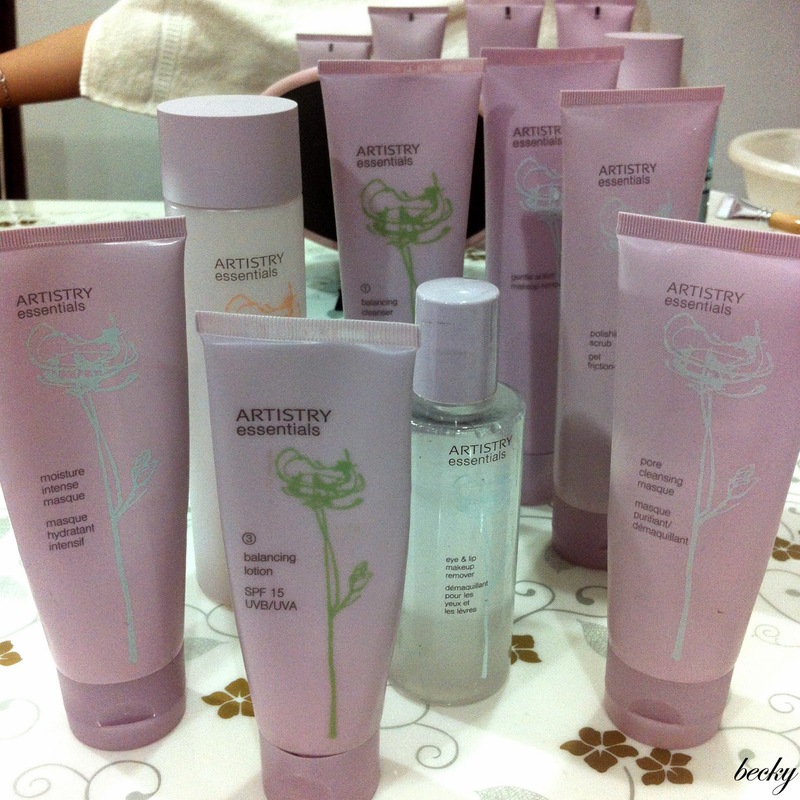 We get to try out few of their range - from the basic to treatment range. Of course, apart from the photo above, they have much more products. Before our therapy, we were given a brief consultation by Yee Mun and Fiona. Before the therapy, always make sure you removed all the make-up and your face is cleansed thoroughly. 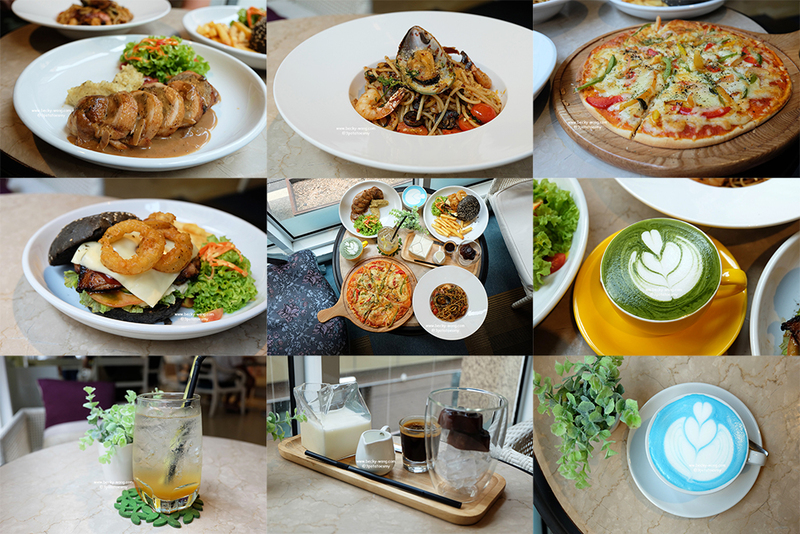 The products (eg. moisturizer, essence and etc) will be applied before the scraping session, so that you skin can absorb all these goodness! I love the masque that they applied for me - it's Pore Cleansing Masque. The masque has a slight cooling sensation and it's really soothing. 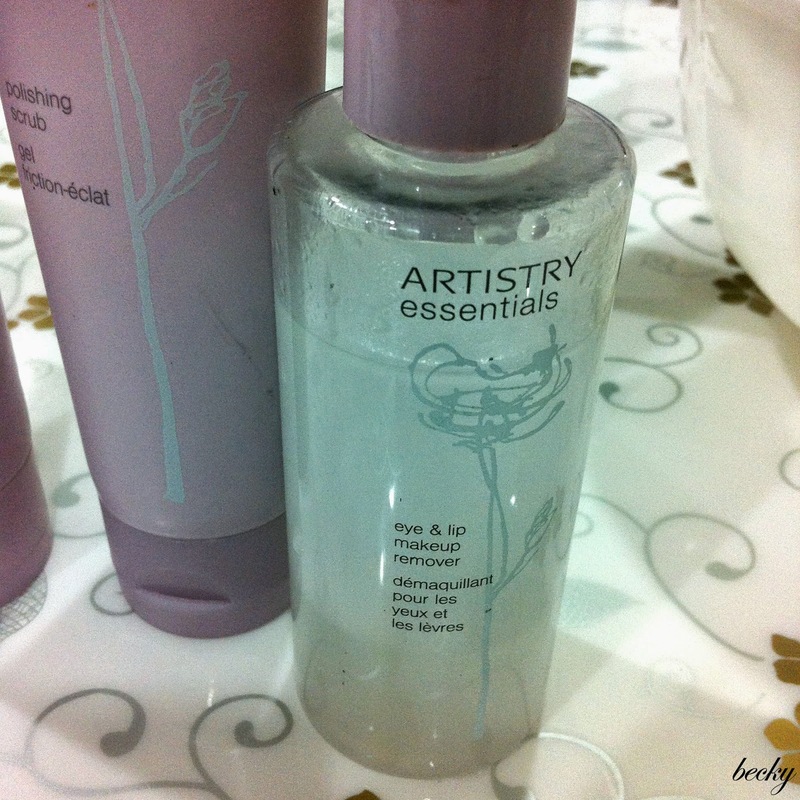 The texture is somewhat like clay masque; but unlike clay masque, it doesn't dry up and crack. Also, unlike clay masque it doesn't have the uncomfortable feeling of tightness too. Let the scraping therapy begin! I was a little worry, but it turned out well. The session was very relaxing - to a point that I could fall asleep. By targeting and massaging different acupuncture points on your face, you'll feel you face starting to get warmer; but that's normal. Remember that I mentioned earlier that they don't use baby oil/normal oil to massage? They use their moisturizer for the scraping therapy. Notice the little black thingy that the therapist is holding against my face? This is the buffalo board that is used for the scraping therapy! It looks like a fish, doesn't it? We were told that it's being designed in the way, based on our face structure. Check out the before and after effect. My laugh line has lightened compare to "Before". I have acne scars on my cheek (though it's not visible from the photo), and I noticed the redness has lightened after one therapy. Also, my skin looks has more glow to it too (can see from my forehead)! There are a few products that I find interesting. 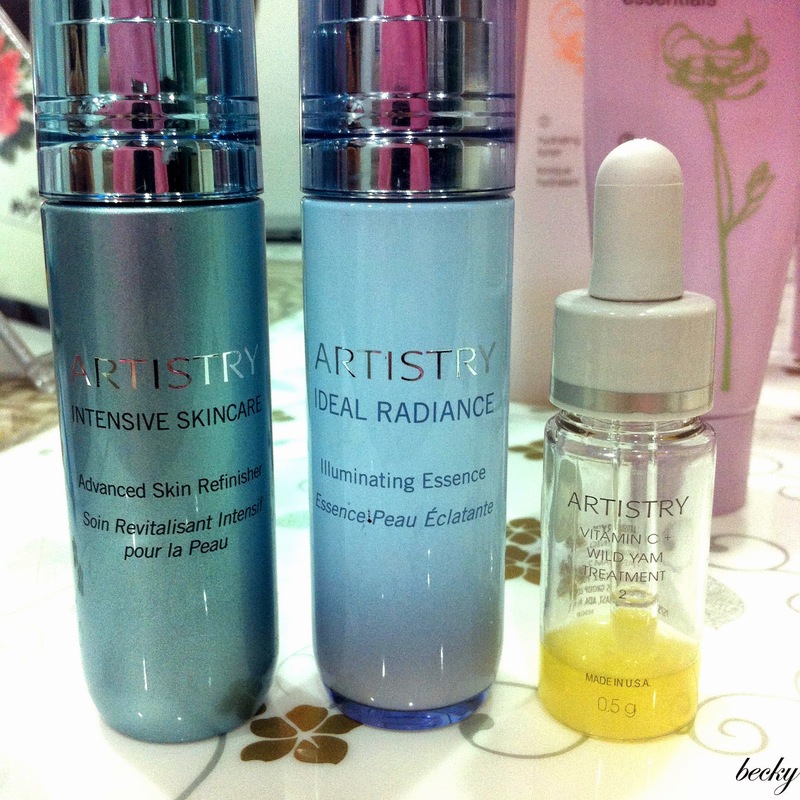 I applied the Advanced Skin Refinisher (Intensive Skincare) together with Illuminating Essence (Ideal Radiance) on the back of my hand, and it brightens up as well as smoothen out my skin. **Sorry, forget to snap a pic. The little bottle of yellow liquid is actually a mixture of Vitamin C and Wild Yam. I find that it helps to reduce and improve my acne scars. Overall, I really do enjoy the scraping therapy. I've actually did my 2nd therapy over the weekend. =) Compare to the usual facial treatment, I would prefer this - without the pain of extraction but able to achieve the same beauty results you wanted! I was told that the effect could last up till 5 days! Arte Belle doesn't have any beauty centre, so they actually provide in-house service. How good is that! You can have the therapy comfortably at home (don't get my started on the part where you have to start finding for parking space =_=). Interested to try it out? They have a promotion for first trial. Instead of RM168, you only pay RM128 on your first trial.